Find a 15% off promo code and giveaway at the end of this post! Can we get that hashtag trending, please? #OhMyCod! These are basically the words that escaped my mouth upon digging into this refreshing summer-inspired bowlful. When we think of seafood pasta, we think of sweet scallops and clam shells nestled into a saucy nest of noodles; we think of plump shrimp being speared and twirled with pasta at the mercy of a fork and spoon; rarely, if ever, do we think about a fillet of fish being flaked across our spaghetti. This tender wild-caught Pacific cod is pan-seared to perfection in a lip-smacking herb and garlic butter sauce, then served over a pile of creamy pesto pasta, and it’s totally off the hook. Despite the fact that summer is only really half over, once August rolls around, it feels like the end is near. Why oh why does summer flee us so quickly? Before we know it, armies of pumpkin and butternut squash will be taking over every market one by one for what’ll seem like an eternity — which is exactly why we need to make the most out of our summer produce right now. 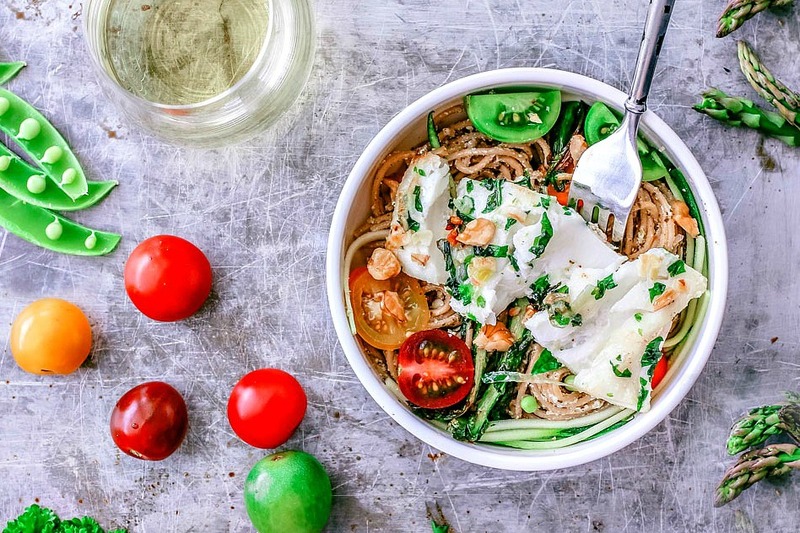 Though the asparagus, plump cherry tomatoes, sweet peas, and crisp zucchini play a large part in this seasonal pasta, the real cape-clad hero is the the glorious fillet of wild-caught Pacific cod from Orca Bay Seafoods that sits on top. Orca Bay’s Wild-Caught Alaskan Cod gets a garlicky and herbaceous butter bath alongside some crisp asparagus. Wild-Caught Alaskan Cod is the *real* mvp! A good quality cod is the perfect gateway fish. It’s meaty, light, mild in flavor, and it’ll likely convert any fish skeptic into a fillet lovin’ fiend! So if you’re trying to bring more fish into your diet and don’t know where to start, or if you’re trying to sway a naysayer, cod is the answer. But know where it comes from. Best Choice: Pacific cod caught in Alaska is a total win. It’s a “Best Choice” because the population is healthy and there aren’t any major concerns with bycatch or with the effectiveness of management. This is the kind of cod you get with Orca Bay. Good Alternative: Pacific cod caught in California, Oregon, Washington, and British Columbia, Canada, with bottom trawls is a “Good Alternative”. There are, however, some concerns about other species being caught along with Pacific cod as well as the impacts on sensitive habitat. Avoid: Japan and Russia = red flags everywhere, and this is why they’re on the “Avoid” list. In Japan, overfishing is presumably happening in most regions and, sadly, management is ineffective. In Russia, information about the populations’ status, bycatch of other species, habitat impacts, and management is extremely limited or unknown. Not sure if Orca Bay Seafoods, Inc. is available near you? Find out here, or shop their online store! For a chance to win 2 10 oz bags of yummy Pacific Cod from Orca Bay Seafoods, go to my Facebook page and follow the instructions! Wild-caught Alaskan cod is pan-seared to perfection in an herb and garlic butter sauce, then served over a creamy pesto pasta with fresh summer produce. 3.5 oz whole wheat spaghetti but do we ever really make the right amount of pasta?? Prepare your extras if you're using them; toast the walnuts, julienne the zucchini, slice the tomatoes, shuck your peas, and toast the walnuts (see notes). Cook the pasta as per the package instructions. Once the pasta is done, save 2 TBSP of pasta water; drain the pasta of the rest and set the pasta back into the empty pot. While the pasta boils, cook your fish. Heat butter over moderate heat in a non-stick pan or seasoned skillet. Once the butter is melted, add the garlic and shallots, and lightly simmer until the garlic is fragrant and the shallots are translucent — approx. 3 minutes. Make sure not to brown the garlic; lower heat if need be. Add the chopped herbs and white wine, stir, and bring to a low simmer. Pat the fillets of cod with paper towels, and season with a bit of kosher salt and cracked black pepper. Carefully place the fillets of cod into the pan, and add the halved asparagus spears. Cook the fillets for three minutes, spooning butter mixture over the top of the fillets periodically to bathe them in the butter sauce. After three minutes, carefully flip the fillets and cook for another three minutes, or until the fillets reach an internal temperature of 145 degrees F. Once done, remove the pan from the heat, and carefully transfer the fillets and asparagus to a plate. Reserve the butter sauce. Stir in the the reserved pasta water, butter sauce, pesto, ricotta, and raw zucchini (if using) into the pot with the pasta. Stir and toss the pasta until everything is well combined, and transfer to plates. Top the pasta with the fillets and the asparagus, then top with cherry tomato slices and toasted walnuts. Take your dinner to the patio, pour some crisp white wine, and enjoy the summer evenings while you still can! *In order to celebrate the crispness and freshness of summer produce, I decided to throw the "extras" in uncooked. The cool cherry tomatoes, crisp zucchini, and sweet peas bring a punch of freshness to the dish. You can, however, cook them in the butter with the fish and asparagus or, if you'd rather skip them entirely, you can do that too! I'd definitely include the toasted walnuts, though. They add a wonderful crunch and pair amazingly with the tender fish and herbaceous pesto. *To toast the walnuts, heat a small pan over low heat. Add the walnuts to the pan, and toast them until aromatic and lightly golden, stirring them often. Keep a close eye on them so you don't burn them. Haha, feel free to add it ;) And thank you! It makes me happy when people notice and appreciate the mentions of sustainability, because it means more people are caring about it. Your pictures are so gorgeous.. Makes me want to grab from the screen asap!! This looks absolutely delicious. Your photos are amazing too! That Garlic Sauce With Pesto Pasta looks absolutely gorgeous. I definiterly love the optional veggies in there. Sounds so good! #ohmycod! I love the hashtag! I also appreciate the focus on sustainable seafood. I love fish, but want to make responsible choices!